As human beings, can we ever stop talking? When our phone is glued to our hand and becomes the extension of our limbs, it’s hard to imagine a day without “communicating.” Yet over the years, the silent retreat has become a new trend, even among celebrities like Oprah and Gisele Bundchen. And of course Bali is the leading place for this experience, as the island is considered to be a mecca for healing and meditation, with Ubud as its capital. But faraway in the middle of the quaint village of Mongan in Tabanan, Bali Silent Retreat had me captivated with its humble charm. Nestled in a four-hectare parcel of land and amidst the tranquil atmosphere of a village, Bali Silent Retreat is the place to be for rejuvenation and restoration. The retreat is a building complex designed in ashram style, encompassing an accommodation, a common lounge, and a meditation bale – all are surrounded by rice paddies and dense tropical jungle. The rooms are modest yet comfortable, but please note that there is no designated butler to serve you. Once you are done with registration, you will be given a bag with a set of linens, towels, and a blanket – yes, you will need to set up your own room. But don’t be intimidated just yet. 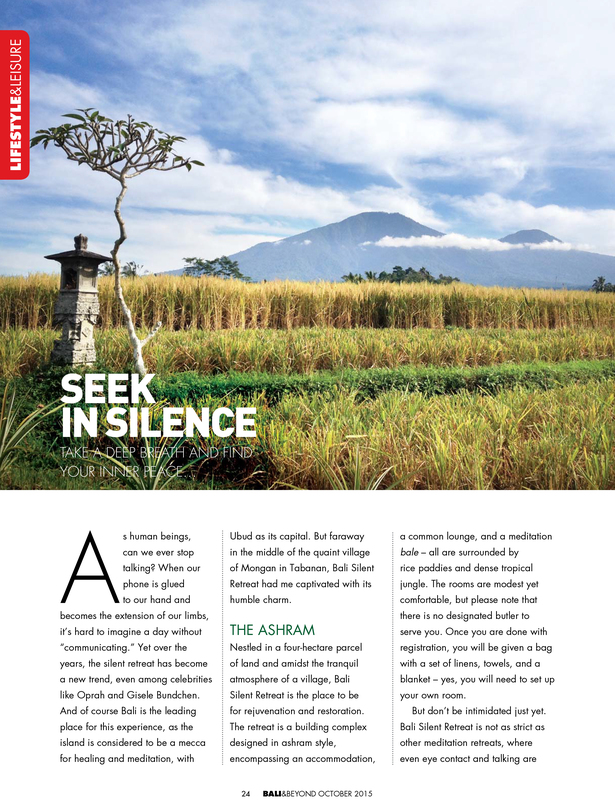 Bali Silent Retreat is not as strict as other meditation retreats, where even eye contact and talking are forbidden. This retreat is open to anyone, and has no fixed schedule for any practices aside from regular activities like the morning and evening meditation and yoga. The morning class starts at 6 a.m., while the evening class has a more flexible schedule. There are also spontaneous activities such as walks around the rice paddies, a jungle tour, and a trip to a hot spring – though they all depend on the availability of the volunteers. But even if you don’t get to do these fun activities, it is not a problem because actually doing nothing is much encouraged. After all, that’s why you come to a silent retreat, isn’t it? To spend some time alone with the one person you need to take care of…yourself. On my first night I took my first meditation class, Chakra Balancing. Walking from my bungalow to the octagon bale I could feel the chilly night engulfing me, and saw almost nothing but darkness as the path had limited lighting – I’ve been warned that the electricity supply is limited – and I could hear some night animal sounds. This total silence was pretty intense. As a non-profit eco-community, Bali Silent Retreat employs extreme green measures. All electricity is generated from in-house solar panels; the water is derived from distilling a local spring, while all vegetables are harvested from their very own garden. This place truly highlights the meaning of meditation; to be conscious of your own energy source and consumption, be it electricity or food. Guided by Luke, the volunteer instructor of the night, eight guests sat in circle in the octagon bale for the Chakra Balancing class. The class helped me go deeper into my subconscious to balance each of my chakra points – I have to say, this meditation soothed my mind and I slept really well that night. The next morning, Mount Batu Karu greeted me from afar as I left my bungalow, and the golden rice paddies were spread out as far as my eyes could see. Walking to my morning class I came across and shared a smile with some local farmers who were ready to start their work for the day. This majestic view of Mount Batu Karu and the rice paddies, and the humble smiles from the locals already calmed my mind. I felt even more at peace as my morning meditation began, followed by some Hatha yoga for relaxation. Once the yoga was done, it was time for breakfast in the garden. As a practitioner of slow food and conscious eating, Head Chef Simon Jongenotter introduced New Earth Cooking as a food philosophy that entails taking responsibility for sourcing, preparing, and eating food in unprecedentedly unique and healthy ways. The results are selections of vibrant and healthy meals that kept the guests munching on in silence. There is no agenda after breakfast, and guests are left to their own devices. During this “me time”, I was surprised to see how my mind wandered from one thing to another so quickly. And that’s how meditation helps, not to calm the mind but to observe and put things into perspective. And so I decided to meditate in the labyrinth located next to the octagon bale, which turned out to be a highly personal experience. It is a chance to ask yourself some questions and find your own answers. Meditating in a labyrinth is actually an ancient practice, and quite common in countries like India, America, Egypt, and Indonesia – but Bali Silent Retreat is the one and only place in Bali that provides a labyrinth for meditation. Surrounded by lush greenery, the labyrinth is cornered by eight pilings, each carrying a massive crystal rock on top. As you walk into the labyrinth, please be mindful with each step and feel the sensation as your feet touch the wet grass. You can also pray, depending on your belief. Meditating in a labyrinth is also believed to induce a receptive state of consciousness. As you meander back and forth in the labyrinth and your direction shifts, you also shift your awareness from right brain to left brain, and that helps improve your consciousness. Perhaps it’s the lush trees, perhaps it’s the fresh air, but I did feel a sense of freedom as I finally reached the inner center of the labyrinth, so I decided to stay there to absorb all the positivity from my surroundings. My mind started to get clear, and things began to unravel. And in that total silence, I felt peace.